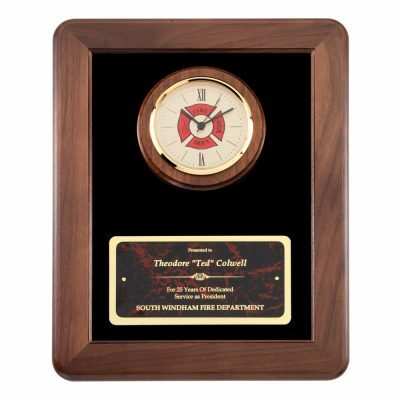 Show appreciation to a fire company top responder or rookie of the year with this fire award. This Red Maltese Fire Department Plaque is made of walnut with rounded corners and is 12” wide by 15” tall. Both the clock featuring a maltese cross in red, and red marble name plate with brass accents are mounted on a velour background. The matching nameplate can contain your basic artwork and text imprinted in gold to match this award, for a truly classy look. Price includes item, nameplate and basic artwork and text on plaque.